She remembers being sold for $40. New York Age, 22 July 1933. The sailor she married: on 27 May 1874 in Salem, Massachusetts, Laura Whitfield, 30, of North Carolina, married Augustus Mafuta, 40, of “Africa.” It was a first marriage for both. 1880 census, Salem, Essex County, Massachusetts. 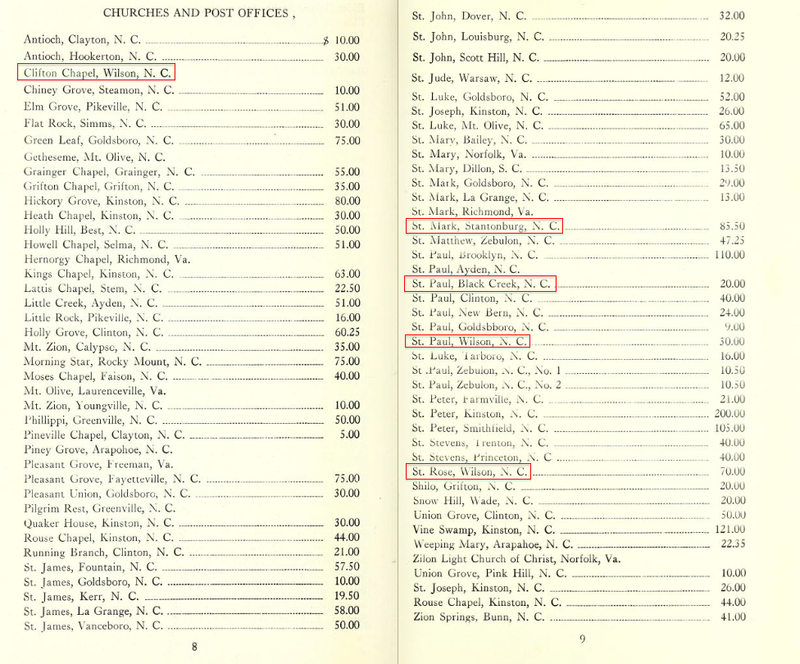 Worcester, Massachusetts, City Directory, 1898. Worcester, Massachusetts, City Directory, 1909. 1920 census, Worcester, Worcester County, Massachusetts. 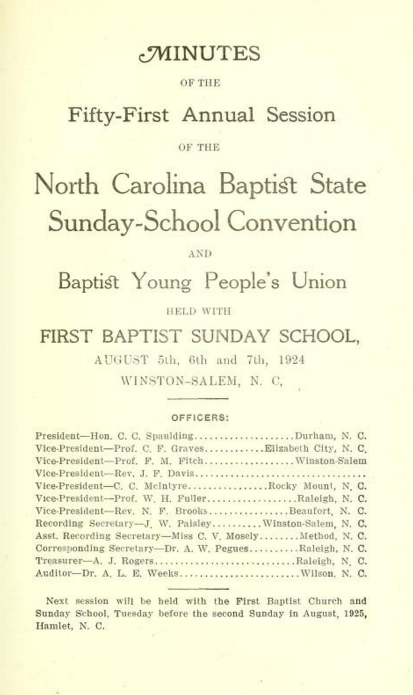 Baptist State Sunday School Convention, 1924. 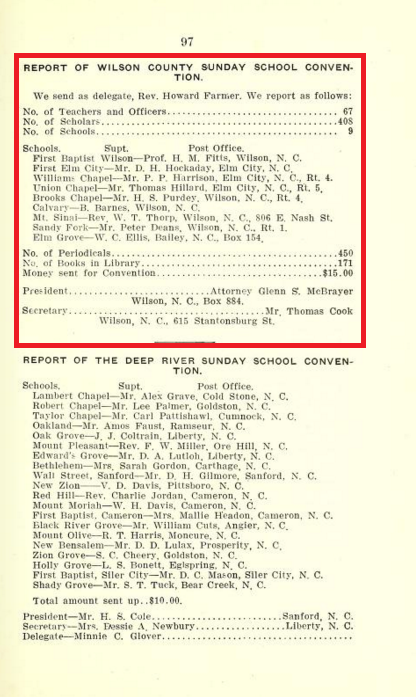 These Wilson County Baptist churches attended the Sunday School convention: Brooks Chapel, First Baptist, Calvary, Mount Sinai, Sandy Fork and Tabernacle in or near Wilson; First Baptist, Williams Chapel and Union Chapel in Elm City; and Elm Grove near Bailey. 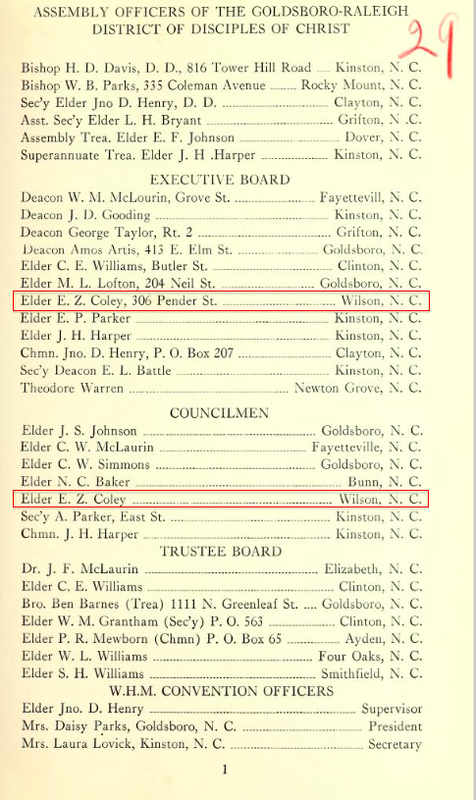 First Baptist (now Jackson Chapel First Baptist), Sandy Fork, Williams Chapel, Calvary, and First Missionary Baptist Church of Elm City are living congregations. Please support the Oliver Nestus Freeman Round House Museum as it begins to expand its walls. The Round House preserves, promotes, and presents African-American history, art, and culture to all citizens of Wilson, NC and its surrounding region. From community trailblazers to nationally known personalities, the museum strives to increase awareness and appreciation of the numerous contributions that local people of color have made to society. The Round House building was constructed by Oliver Nestus Freeman, who was born in 1882 in Wilson County to former slaves. He was educated at the Tuskegee Normal School in Alabama and returned to Wilson to build houses, including a number designed to help alleviate the shortage of affordable housing for soldiers returning from World War II. Freeman’s services were especially sought out for his fine stonework. The museum’s expansion plans will allow it to showcase Freeman’s unique stone three-room round house, as well as offer additional exhibition space, a community conference room, and a resource center. Please consider giving during The Round House’s fundraising campaign. My father, batboy R.C. 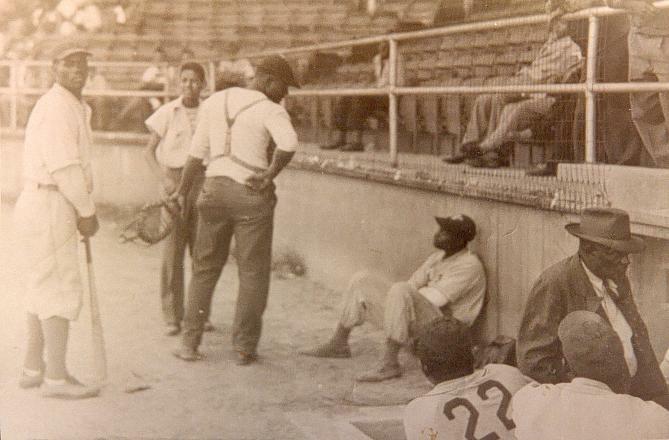 Henderson, second from left, at a baseball game at Fleming Stadium, Wilson, circa 1945. From the collection of Lisa Y. Henderson. One named Daniel, commonly called Possum. Item first. I will and desire my Executor hereinafter named to provide for my body a decent burial and to pay all my just debts out of the first monies coming into their hands as a part and parcel of my estate. 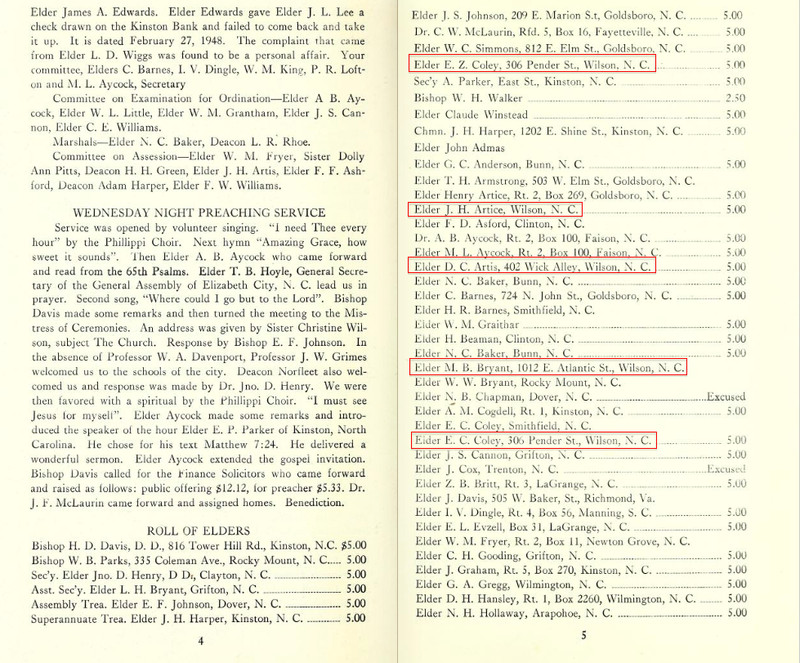 Contrary to the four people he named in his will, the 1860 slave schedule of Joyners and Gardners township, Wilson County reports that Benjamin Sharpe owned 15 enslaved people, ranging from a 45 year-old woman to a one year-old boy. They were sheltered in just two cabins. 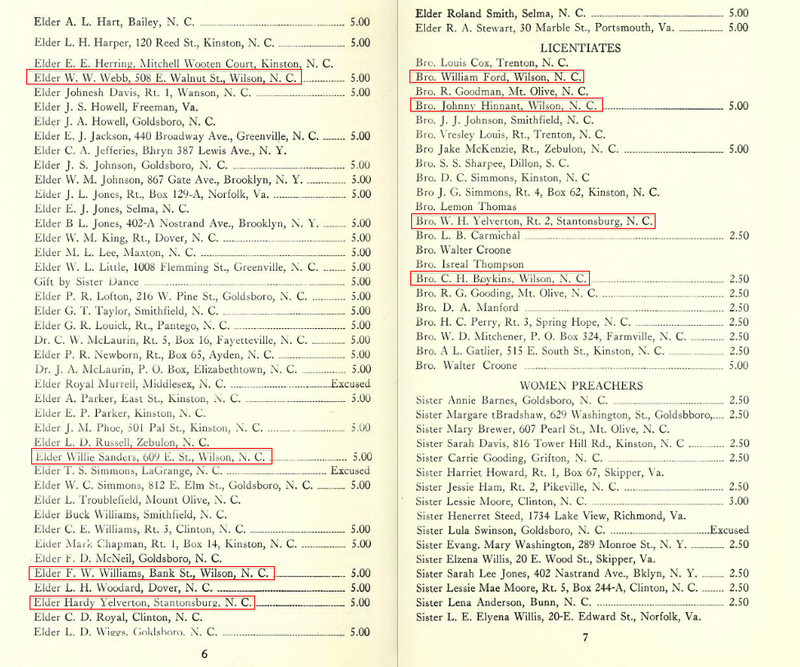 Wilson County marriage records show that Abram Sharpe, son of Church Bynum and Thana Sharp, married Caroline Hines, daughter of Allen Hines and Harriet Hines, on 12 January 1869. In the 1870 census of Joyners township, Wilson County: farm laborer Abram Sharp, 30, wife Caroline, 19, and son John, 9 months. A death certificate shows that widow Caroline Sharp died 1 February 1935, in Pinetops township, Edgecombe County. She had been living on Leggins farm, and her parents were listed as Allen Hines and Caroline Lancaster. 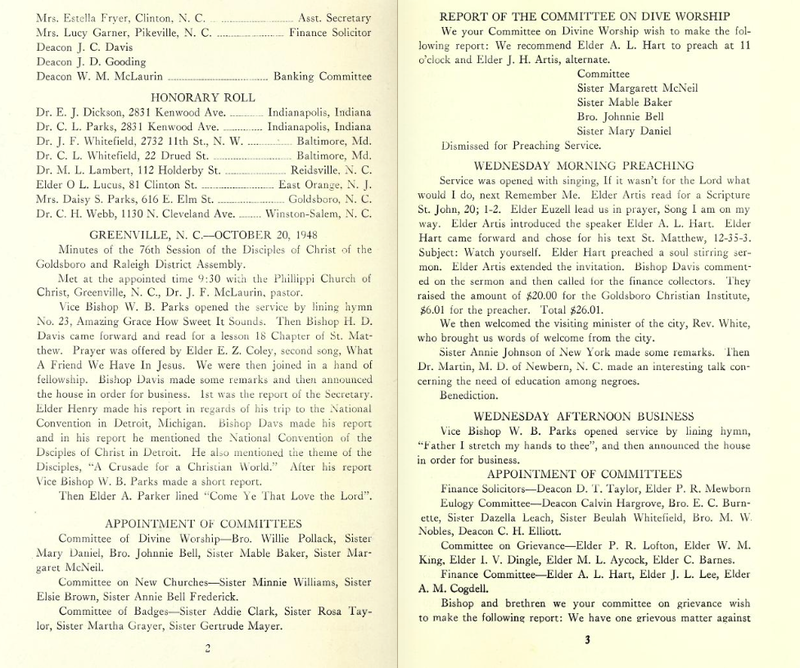 “Possum” may have been the farm laborer Daniel Sharpe, 26, listed in the household of Benjamin Tillery in the 1870 census of Gardners township, Wilson County. A faithful Christian, a kind neighbor, a loving mother. 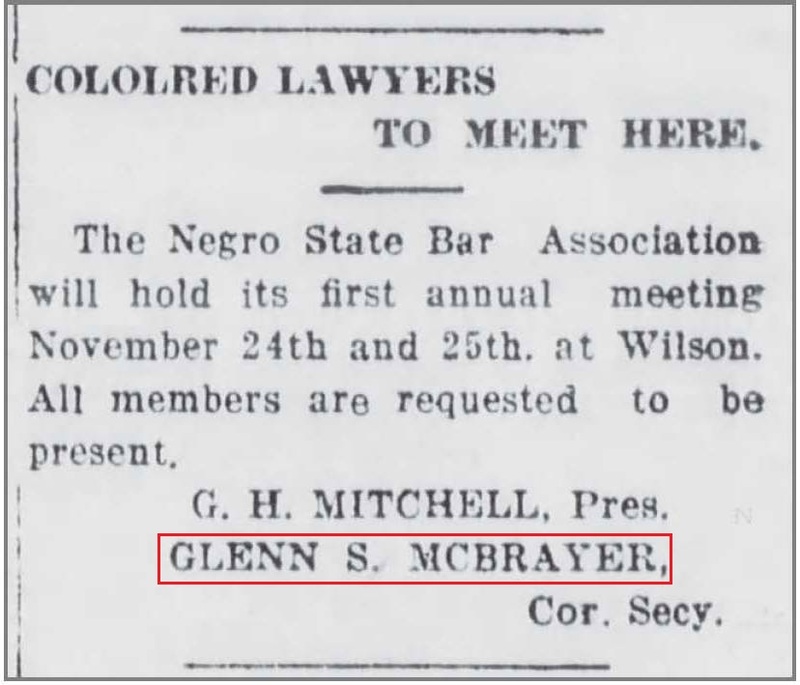 Wilson Daily Times, 2 August 1929. Judith Davis was born in 1843 in Edgecombe County, North Carolina. Her death certificate lists her parents as Jack Edmundson and Synthana Edmundson. 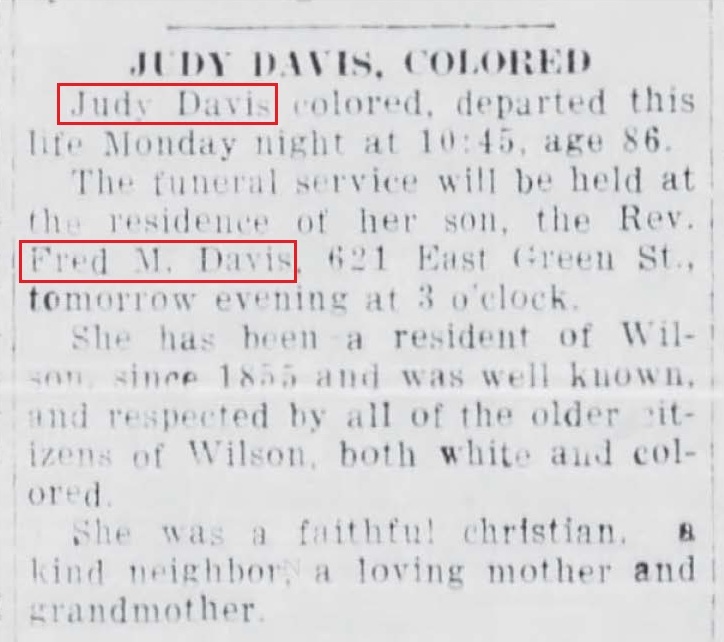 She appears as 27 year-old “Judia” Davis in the 1870 census of Wilson, Wilson County, in a household that includes Sarah Davis, 54, and Judy’s children Fredrick, 4, and Mary, 2. All are erroneously classified as white. 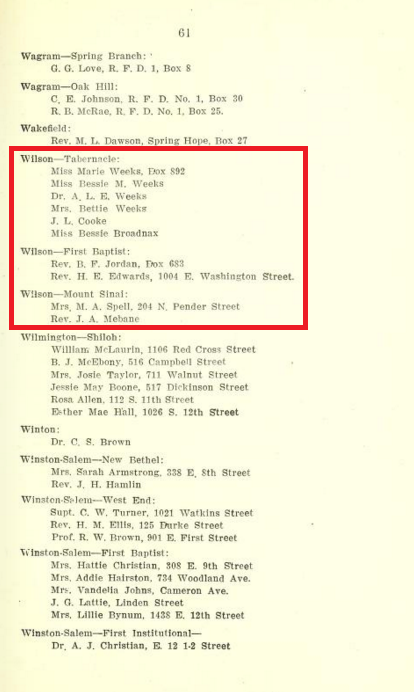 Fred’s (and perhaps Mary’s) father, in fact, was white — Joseph Watson Davis, a 38 year-old agent for a commercial merchant, who lived nearby. [Joseph had sons Bayard Mershon (1859-1882) and William (1863-1943) and a daughter Addie (1876-1965). Rev. Fred Marshon Davis, longtime pastor of Jackson Chapel First Baptist Church, named one of his sons William Bayard and a daughter Addie.] Judith had at least one other child, son Alfred Davis, who was 20 days old at the time the 1880 census was taken. Judith Davis died 29 July 1929. Prayer was offered by Elder E.Z. Coley of Wilson. 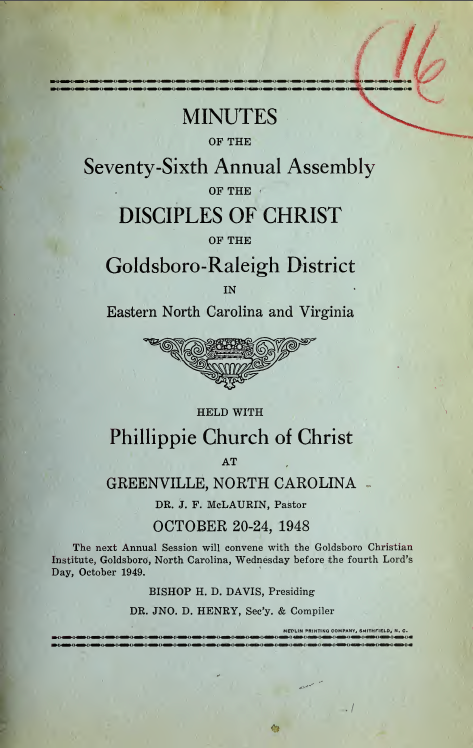 Excerpts from the Minutes of the Seventy-Sixth Annual Assembly of the Disciples of Christ of the Goldsboro-Raleigh District in Eastern North Carolina and Virginia. New York Age, 25 May 1935. 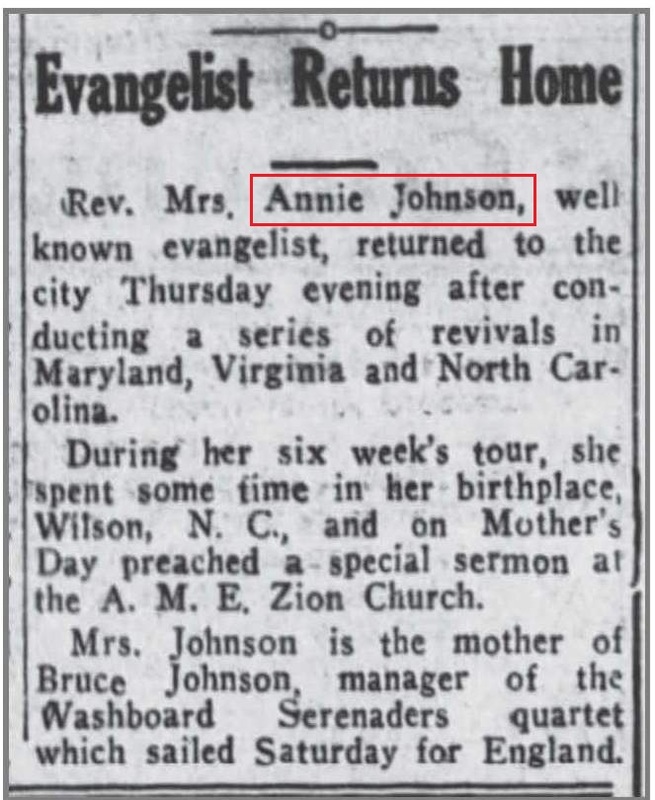 I have not found anything definite on Evangelist Annie Johnson, but here are Bruce Johnson and his Washboard Serenaders in 1934. Bruce is on washboard and vocals. Mary McLeod Bethune addresses women in Wilson. 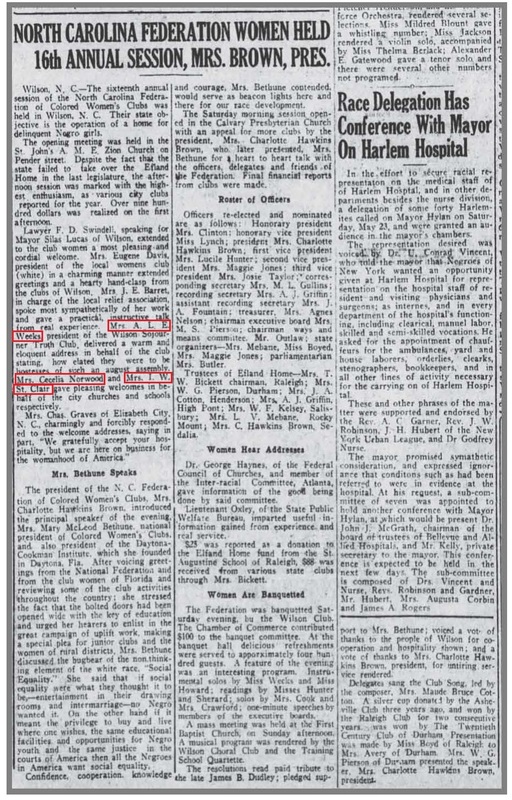 New York Age, 30 May 1925.